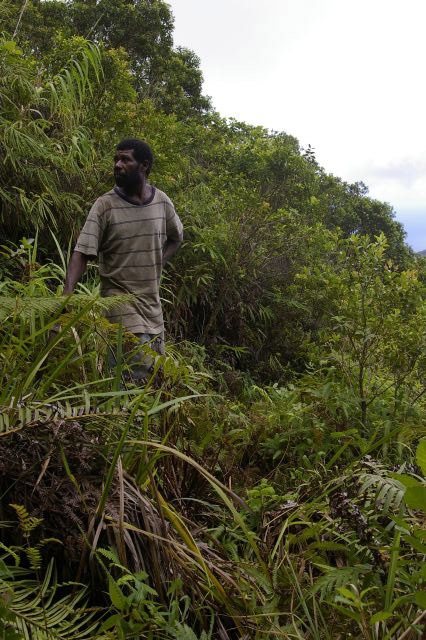 Two of Te Papa’s Natural Environment staff recently returned from two weeks seabird research in northern Vanuatu. Colin Miskelly (Curator Terrestrial Vertebrates) here recounts some of the adventures he had with Alan Tennyson (Curator Fossil Vertebrates) during early March 2011. Back in 2001 New Zealanders Mike Imber and Alan Tennyson proposed a new species of gadfly petrel, the Vanuatu petrel (Pterodroma occulta), based on 6 specimens collected at sea in northern Vanuatu in 1927, plus one storm-wrecked in Australia in the 1980s. 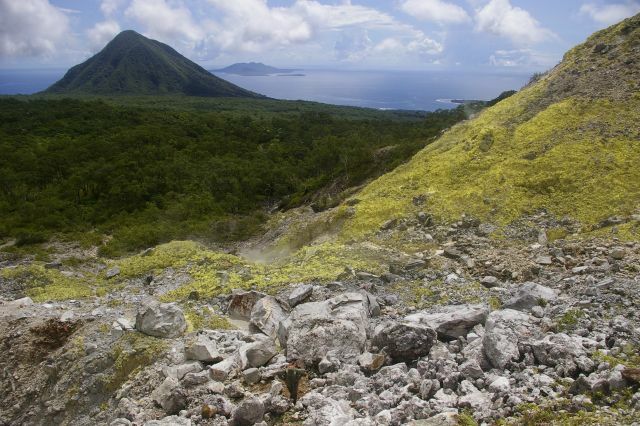 The breeding site for the birds remained a mystery until Australian-based naturalist Stephen Totterman followed up stories related to him by villagers on Vanua Lava (in the Banks Islands), and found two nests on the slopes of the volcano Mt Sereama in early 2009. 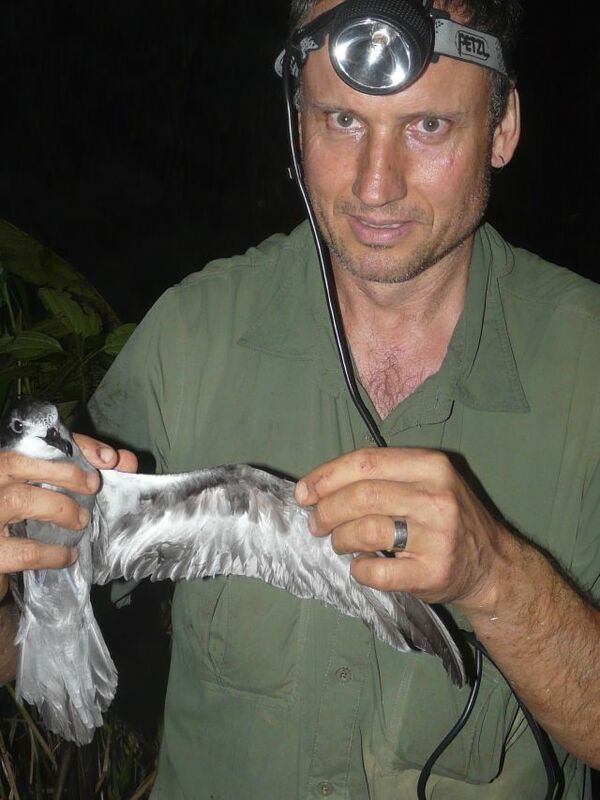 Stephen invited Alan and Colin to return to Vanua Lava with him this year, to survey the extent of the colony, and to collect measurements and DNA samples to compare with the closely related (larger) white-naped petrel from the Kermadec Islands. After leaving Auckland, we island hopped from Port Vila to Espiritu Santo to Gaua and then to Vanua Lava. From Santo we were accompanied by government representative Anaclet Philip. Stephen met us at Sola airport, and a couple of hours later we were on a small boat heading 5 km or so along the coast to the village of Lalngetak, where we were the guests of honour at a kava ceremony. We were introduced to our local guides Manman and Ala, and the following morning the six of us plus three hired porters set off on the 4 hour tramp inland through wet tropical forest to the camp at the Qwelrakrak solfatara field at the base of Mt Sereama. It was the wet season, hence few tourists, and hordes of malaria and dengue-fever bearing mosquitos. They were intolerable at Lalngetak, but were scarce after we gained altitude heading inland, and almost absent at Qwelrakrak. 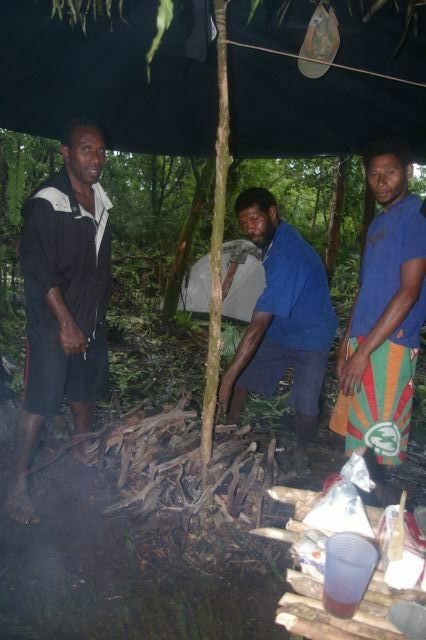 The camp was very basic – three 2-man tents, a palm-leaf-covered cooking shelter over the cooking fire, and a larger dining shelter that we covered with polythene. The shelters were all made from materials at hand, with Manman and Ala using their bush knives (machetes) with great skill and effectiveness. The cuisine was even more basic – anyone for boiled white rice with a dollop of tinned tuna on top three times a day for 6 days? I exaggerate, as three of us spent three of the five nights on the summit of the nearest peak of Mt Sereama, 300 vertical metres above us, where we enjoyed a more exotic picnic dinner of peanut putter on cabin bread. Three nights in a row. 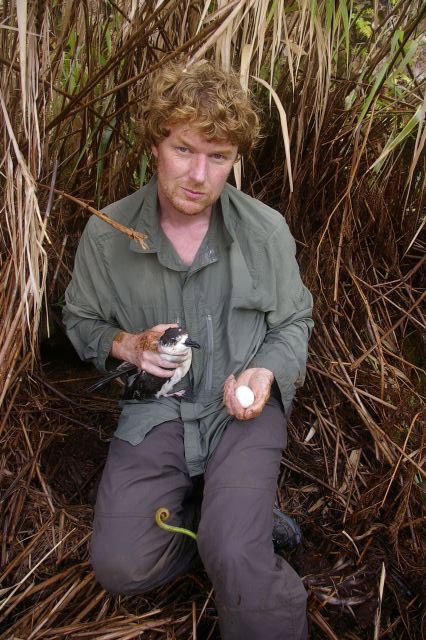 Stephen, Manman and Ala had located five burrows of Vanuatu petrel in about 2 weeks of searching, but had not handled any birds, as none was at all keen to put their hand into a hole containing a stroppy sharp-beaked petrel. Alan and I had no such qualms, and with our high-tech petrel locating tool (i.e. the palm of the hand and exhaled breath to make a first nation war-whoop), we set about locating nests and attracting flying birds in. The war-whoop is equally effective at attracting gadfly petrels – one flew into my midriff the first night (and bit me through my shirt) – and encouraging birds inside burrows to call, to facilitate locating burrows, and determining if they are occupied. In this way we located a total of 16 nests with eggs during our five nights at the colony, extended its known boundaries, and handled 27 adult birds. But the real intrigue started when Manman, Ala and Anaclet completed cutting a track to the summit of the 800 metre peak above Qwelrakrak. We had been puzzled by the variety of petrel calls we were hearing at night, and we soon discovered that this was because there were two species present – Vanuatu petrel, and the even more poorly known ‘magnificent petrel’Pterodroma brevipes magnificens, named only in 2010 based on six specimens shot at sea at the same time and location as the original Vanuatu petrels in 1927, and more recent observations (2009) at sea off Vanua Lava. As the name suggests, these are spectacular looking birds (coal black with white faces and parts of the underwing), and are the smallest members of the genus. 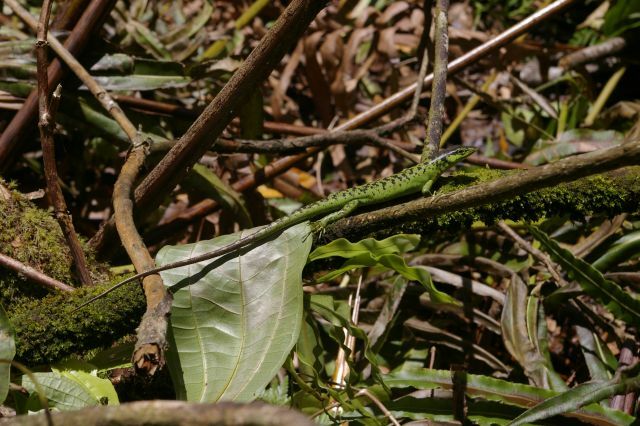 On our first night at the summit we saw several in flight, and figured out that they were the source of an unusual call coming from the dense umbrella fern and wild cane grass around us. Alan eventually succeeded in catching one, which was duly photographed, measured, bled, and photographed again. We returned to camp elated, and based on the number of calls around us were confident that we could catch many more, and perhaps find nests. The next day we instructed Manman and Ala to cut four 4 metre long poles and to carry them to the summit, where they set to cutting a 20 metre long mistnet site along the cliff edge. We eventually got both nets up, but by then the wind had got up and the nets were billowing like sails on a galleon, rendering them all but useless. There were very few birds calling that second night, but either despite or because of the nets, we did catch one more bird, just beyond the nets. Somewhat to our surprise, it was a pale bird, which contradicted the description for the subspecies. Our visit was in the wet season, which meant a lot of rain. 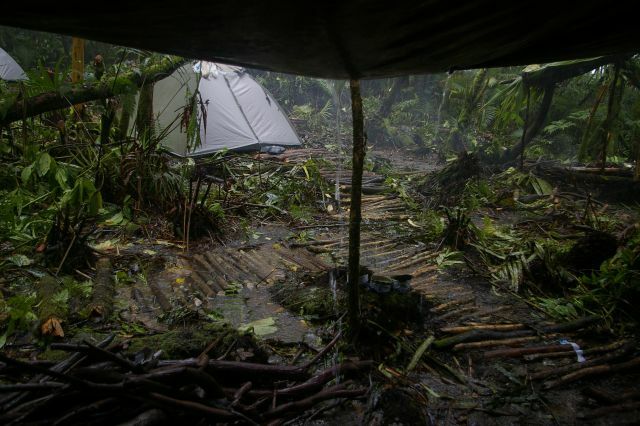 We had 8 hours of continuous torrential rain one day, turning our camp into a quagmire. Along with the heat and sweat whenever the sun came out, we had two states of being for the six days – wet or damp. This affected people, electronics and other equipment, as well as the general discomfort of living in mud. The one redeeming feature of the site was the thermally-heated water, and we soon constructed a luxurious bath in the outflow from the solfatara. On our second night at the summit we were caught by one of these torrential downpours, and beat a sodden retreat to camp. We only had one more shot at catching further collared petrels, as we were due to depart the summit on 10 March. Neither Alan nor I give up easily when there are rare birds to catch at night, so we packed our peanut butter crackers and gave it one last shot. But it was not to be. The winds were even stronger, and though we saw a few birds in flight, we did not catch any, and the only ground calls we could trace were in dense vegetation on the lip of a 300 m cliff. It was time to retrace our footsteps (slowly, due to trench foot in some cases, and diarrhoea in others) and head back home via another kava ceremony, mosquitos and tsunami warning.